I'm doing summer research at the Cornell NanofabricationFacility. When you're making nanoscale features, dirt is a problem, so wework in a cleanroom. This involves wearing a lovely blue bunny suit toprevent all of the nasty skin particles that we shed from contaminatingour samples. 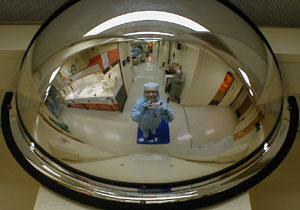 This picture was taken in a rounded mirror in the corner ofthe cleanroom. That's a chemical hood to the left and the entrance to the SEM (scanning electron microscope) room on the right. Charming ensembleI'm wearing, isn't it?